Emily Rapp was a creative writing student of mine at St. Olaf College in the early 1990s. She was an unusually gifted writer even as an undergraduate, standing such head and shoulders above the other students that it was a given that she was headed for a successful career as a writer. She was also lovely, a beautiful, vivacious redhead, delightful in every way to the extent that I knew her. She had just about everything she needed already in place: a keen intelligence; a gift for language; a rich, complex sensibility; and a literary style and voice already well developed. The only thing she lacked was age and experience. Time would take care of both of those. She did indeed go on to a distinguished career as a writer and professor of creative writing. In 2007 she published a memoir called Poster Child, which, for reasons lost to me now, I never finished reading. I think the subject matter, her experiences with having her left foot amputated at age four due to a congenital defect, and losing her entire leg by the age of eight, didn’t engage me sufficiently. Of course it is about more than that—about living with a disability, about self-image, especially as a female, about acceptance of one’s body, no matter if flawed. Emily now has a new memoir out which is getting a lot of attention, such as a full-length, positive review in The New York Times Book Review. She was on the Today Program (I know because we’re friends on FB), and the book is being widely reviewed and well received. 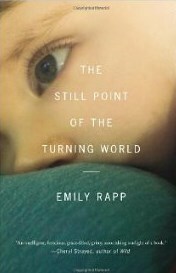 The memoir, The Still Point of the Turning World, traces her ordeal and grief over the shocking diagnosis in January, 2011, that her son, Ronan, nine months old, had Tay-Sachs disease, an always fatal, genetic, degenerative disorder that usually results in death by the age of four or five. At the suggestion of a friend, Emily began blogging about her experience. The blog, Little Seal, (“Ronan” means “little seal” in Irish) was named one of the 25 Best Blogs of 2012 by Time Magazine. Emily had found a great outlet for the turmoil in which she was swept up, and an appreciative, sympathetic audience. I stopped for a moment and gently removed his hood. I let the wind ruffle his red-blond hair and I looked at his sleeping face and I rocked him for a bit in the sun. We kept walking into a tunnel strewn with dry leaves where both our shadows disappeared and we were alone. I stood still and listened to his breath and mine. I felt a momentary flash of peace, a great still pause. T.S. Eliot’s ‘still point of the turning world,’ and of course this terribly tender love, and I thought, This is all I have to give, and I tried with all my strength to pass that feeling into Ronan, and then I thought, Remember this. The more I wrote about Ronan, the more I understood that the only way grief would not take me down completely was to greet his diagnosis head-on and make my world big, make his story known. His myth is an account of loving and letting go, it’s about art and literature and movies, about theology and philosophy and animals. It is about the joys and costs of refusing to look away, of diving into the abyss and kicking around in it, about going forward in life even though there is no sign that things will change or be solved or get better. At time it felt as if anything Emily wrote ended up in the book. I longed for a good, hard-nosed editor to make some tough decisions and whip it into better (leaner) shape. Maybe it is uneven – some great stuff, some parts that needed tightening or deleting – because it seemed rushed into print. Emily’s writing in her “Little Seal” blog was so striking and the story so wrenching that she was garnering a great deal of attention and praise. It must have been a partial antidote to her pain and grief to have all the attention and excitement the blog was generating. I imagine most everyone involved saw an opportunity to capitalize by bringing out the memoir as soon as possible. It was published a month after Ronan’s death, which means it was in production months before he died. The subject was grief, not necessarily the whole story of Ronan up to his death just shy of age three. Still, I wonder if maybe it would have been a better book if more time had passed before it was published. Why? Why is being nice over? I thought of the story of the mustard seed, where a woman whose son has died is stuck in her grief and pain. She seeks counsel from a Buddhist monk, who sends her to find someone who has not experienced pain and suffering and ask them for a small mustard seed. She goes from house to house all over the kingdom, but cannot find such a person. She returns to the monk, having learned the lesson that no one is spared. We felt grotesque and out of place in our own lives. You can, for just a moment, fuse grief like a bone, but the memory of the ability to bend lingers inside, like an itch running in the blood, just beneath the skin: relief is always temporary. Grief, we understood, would now hijack a part of our day for the rest of our lives, sneaking in, making the world momentarily stop, every day, forever. It is this kind of writing, rather than a discussion of Thomas Mann’s The Magic Mountain, that makes Still Point a remarkable book. I found the last part of the memoir incredibly moving, to the point of tears. Emily and her husband (the marriage, sadly, did not survive Ronan’s illness and death) visit Upaya Zen Center near Santa Fe where they live. There it feels as if all the desperate striving, questioning, and intellectualizing that have consumed so much of Emily over the course of Ronan’s fading begins to fall way. Emily starts to accept Ronan’s inevitable early death and come to terms with it. One of the sessions involves photographs of dying people, or the “death portraits” of people who had just died. In the Buddhist tradition, dying is an inevitable part of life. Learning how to live is about learning how to die, both figuratively and literally. Dying to the delusions. Dying to the relentless and unending demands of ego. . . All must come unbound and undone. All will unravel. It’s one thing to accept this on an intellectual level, but it was an entirely different experience to hear those truths spoken aloud while looking at the faces of people who had just died, some of them showing the marks of struggle, others peaceful, some newly born, others so thin the bones of the face looked almost transparent. Some with open eyes, fearful eyes, open mouths, clenched fists, soft baby skulls. I had the thought that this was perhaps my first moment of being an adult, and that I was, just now, finally prepared to be a mother to Ronan. Other people had weathered this, I thought. So could I.
Emily’s own version of not finding the mustard seed, perhaps. I didn’t want to be a hysterical mess during Ronan’s final moments; I wanted to be loving and calm. I wanted to be a witness. I wanted to sharpen what was essential in my life and let some of the endlessly worrying externalities go fuzzy. I wanted a less bossy brain, a less insistent heart, less clutch at the life of my baby. Anyone who reads this book will want that for Emily, too. Thank you for this nuanced review, which really resonates for me because last night I started rereading Poster Child, since I have a class reading it. I admire it greatly for her technical skill, pitch-perfect persona, and the way this story of a physical disability becomes a story of an inner transformation. A difference is that much time had elapsed between most of the story and Emily Rapp's life, and maybe that's the difference between her two memoirs. I get the sense that writing during and soon after an event poses special challenges for memoirists; time has a way of helping a writer put things in natural perspective. In a related matter, it also could be that the harsh things she said were an attempt to show how disordered she was, yet the writer's persona "now" was not yet developed enough to make clear her perspective. She needed still to be hurt and angry. But please give Poster Child another try; it's a great memoir. I feel ashamed, Richard, that I haven't finished Poster Child — I have it right here, and the fact that you think it's great is definitely an incentive to start over and read it through. I agree that time does have a way of helping the writer put things in perspective. It seems with a lot of "grief" memoirs–I'm thinking of certain widow memoirs in particular–the shock and pain is so raw and the impulse to write so great that there is an immediate outpouring of emotion that the writer captures even as she is experiencing the event. It certainly occurred to me that Emily was doing that, so caught up in how she felt at the time that that was the only truth, perspective be damned! Readers probably get that. But I think you nailed it when you say there was no distinction between what she was experiencing at the time and a "now" perspective that might have separated a little from at least some of the reactions she was having in the moment "then." I'll be very interested in your reading of Still Point. It troubled me that maybe I was judging the writer rather than the memoir, but that is a problem with memoir — you can't really separate the two sometimes. Thanks, Richard, for the recommendation for Poster Child and for your thoughtful remarks. A great review. I do want to read this book. In some ways, it reminds me of what I went through as I accompanied my canine companion into his death, which echoed an earlier loss I had with my father when young. Loving anyone sets you up for grief and loss. Like Rapp, I also found the Buddha's teachings helpful, especially that the teacup is broken the moment it is created (which still makes loss difficult). It's so hard to write about something like this when you're going through it. I wonder what she will write/feel about his years from now? Hi, Jan. It wouldn't surprise me if there is another memoir about the experience further down the line — when some time has passed. At any rate, I'm sure we'll be hearing from Emily again. The first line of the memoir is "This is a love story, which, like all great love stories, is ultimately a story of loss." Yes, love sets one up for grief and loss. And I know what you mean about one loss triggering the grief about an earlier one. Your review was so fair, balanced and gentle, filled with praise as well as very perceptive criticism–and it reinforced my decision not to read this book. Thank you. I ration my books about grief very carefully; one can only bear so much pain. ( I also don't want to read memoirs soaked in art, philosophy, myth, and pronouncements, not to mention bitterness, however deeply felt.) Like you, I am glad Emily found the loving, calm acceptance she hoped for. But I wonder if that is actually a realistic goal for most of us. Epiphanies come in unexpected ways and not at the times we always want them. Why be ashamed if you haven't finished the book? At some point in our lives, we need to make hard decisions about our time. If I'm not entranced by at least the midpoint of a book, I put it down–permanently. I've just finished a so-called "young adult" novel, "The Fault In Our Stars," and I found it stunning. Nothing "young" about it. (It too has been widely reviewed.) Its idiomatic, clear, honed prose and assured voices–the dialogue is sharp and often funny–pulled me into a world of love and grief that did not leave me drowning. Instead of finishing the memoir you started, try this. Your forthcoming memoir–about caretaking of a beloved, failing husband, if I am summarizing it correctly (and correct me if I'm not) is one I won't miss or put down I'm sure! I was struck by the earned wisdom of your line about how maybe acceptance isn't a realistic goal (how well put, Susan) and how epiphanies come in unexpected ways and not when ordered or planned. When my memoir comes out next spring, I won't be peering over your shoulder to see if you put it down! Most of us can happily read in secret. I will at least promise I won't be pontificating or revealing Major Truths. The minor truths are major enough, and usually more meaningful, for me.